In a recent article on ways big data helps small businesses thrive, The New York Times told the story of Brian Janezic, a 27-year-old Arizona man who used FileMaker to streamline the operations of eight car washes owned by his parents and himself. 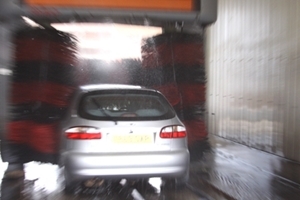 At his two self-service Auto Wash Express franchises, Janezic said he realized that inventory was the only part of the operation that was not automated, and he set out to change that. Using FileMaker Pro, Janezic created an inventory database that he and his three employees can access from their iPads at either car wash. Soon, he expanded the system to his parents' six locations. Now, employees can easily keep track of what products are available and what is needed at all times. When the benefits of the mobile database became clear, Janezic took his high-tech strategy even further, attaching sensors to chemical containers — eight at each location — to accurately track fluid levels and calculate exactly how much of each chemical is used in each wash.
"Now we're able to monitor those levels continuously," he told the Times. "So instead of having two data points in the span of a week, we'll have 500 data points. And we can do that across our entire company. We might want to see how much pre-soak we're using, because we have a standard we want to keep within." Nowadays, big data is more available than ever to small businesses, and FileMaker helps them take full advantage of that information. A certified IT consulting firm can provide companies with customized FileMaker database development as well as FileMaker training services so that employees can update and manage their databases at all times.